Hi, I’m a self-taught 2D animator, and I recently did a 1 minute music video sample. I’ve always wondered who was doing animated music videos for Goldfish (always assumed some UK based animation company). And after going through your website, all I can say is that I’m inspired and more determined to take this animated music video thing serious. By the way, do you work alone? Dear Mike Scott, You don’t know me, but I’ve been following your work for a little over a year since I stumble up the GoldFish video ‘We Come together”. I just wanted to thank you for the work you done. I have really enjoy the simplicity and detail of your style especially in the videos “Goldfish- Get Busy Living” and “The Kiffness-Mr. Incredible.” I am awestuck by how awesome your animation have been especially since you have done them in Anime Studio Pro. So much so I have been inspired by you, I am now challenging myself to do my own music video with a local band I know called [—]. This is a really big project for me. I have only ever done small animations, gifs, and stop-motion short. Is there any suggestion you have for first timer taking on a big project all by herself? […] Thank you for your time and keep being so AWESOME! Best of wish, [—] P.S. If you’re ever in the Atlanta GA area, I would love the chance to treat you good cup of tea. First off, I must say that your work (both music and animation) are unlike anything I have ever experienced before, in a good way. ^.^ I first saw the Goldfish music video and got hooked from there. […] Thanks, and keep up the amazing job!! I also produced and performed the song along with all this stuff on my soundcloud. You’ve been a huge inspiration. All the Goldfish videos are Epic!!! I’m following. dude, your stuff makes me sick!! it way to good!! high f–king 5! I love your stuff mate! I’m abroad at the mo but I plan on coming back at the end of 2012 with some new skills and plans. Look me up on linkedin and stuff. It would be cool to network with you in SA. bought your print at koppie, awesome! Hie mike, i think your work is crazy. i loved the we come together music video. im a designer based in Zimbabwe and working towards getting into animation. Im a big fan of your Get busy living video…and It inspired me to do one for Kid Cudi’s “Sky might fall”..I’ve done all the storyboarding and some of the backgrounds. But I have know real direction as far as where I should start. Thanks..Oh and Im fairly new to photoshop and Anime studio. Hey! Just wanted to let you know that I love your Goldfish – We come together video!!! Really really cool!!! Im an english animation student in Bristol, England. Ive just got into goldfish through youtube and was a little awe struck by the idea of a ‘bands animator’ It sound like a dream oppitunity & your character designs are awesome. I’m a 2D enthusiast, and after seeing your work just wanted to ask if you ever needed any free work done to make your jobs easier, i’d love to help out. Another great animated piece…we just posted your animation as animation of the day! Scott! Just watched your newest video!! You’re getting better with each and everyone of them 😀 Congrats, it looks fantastic! So much fun and so many references that just throw one back into the childhood of the 80’s and 90’s :)) Â Thanks for making another great video. Mike Scott! Â It’s [—] (not anymore, but I’d interviewed you a year or two ago). Â Love the new Goldfish video! Â Fun, fun, fun. Â Hope you’re well, and thanks for introducing me to Goldfish’s music through your animation. hi – Â Â I was just curious, what software is used in your animation? The Goldfish video especially, with the pixel art. I really enjoy the videos! Duuude, awesome job on that 8 bit Goldfish vid… Really proud as a South African seeing something as cool as that come from our shores! Â Â Keep it up! Dang… Â Â Best music video ever. GREAT job, fantastic. And loved the South African flag on the moon! Â Â Eish, keep up the great work! Dear Mike, I’m sure a million other people say this, but I am Goldfish’s biggest fan… and it goes without saying… of your animation too! You do them proud with your psychedelic style and the “matching” to their music… love the “pixelated Space Quest” influence! Totally awesome mate… look forward to the We Come Together final product! MCBN: Your video for Get Busy Living is awesome, do you guys come up with the concepts or do you have a team working on it for you? Goldfish: We come up with the concepts with our close collaborator Mike Scott. We have made 3 videos with him now and he is just an amazingly talented animator and story teller with a classic and quirky sense of humour. We travel so much and our gear is constantly getting lost, so one day we thought how about making a video about the adventures your luggage goes on whilst you are on the plane … Make it a bit more fun. All our designers ever do is make t-shirt designs…FALSE! It’s funny how we are so used to seeing our designers purely as artists that produce designs solely for short sleeve garments, that we forget that they are HUGELY talented in so many diverse areas. This amazing South African designer’s has been blowing us away with his unique quirky cartoon style since Springleap first said hello to the world. Last year Amy did a very informative blog about Mike and gave a link to one or two of his videos that he has done for super popular South African music group Goldfish…yep those guys, wow! 1. He is a top notch illustrator. 3. Drummer in a band. Mike uses an amazing animation tool called Anime studio 7, which allows him to take his design and turn it into mind blowing music videos. Check out his latest music video for Goldfish Get Busy Living […] It’s fantastic how he has taken the song and generated a world around it that captures the essence of the theme. Stop subjecting yourself to things you don’t want to do, get out there…GET BUSY LIVING! I am seriously considering pouring my spare time into learning Anime Studio…it’s too hot. What’s even cooler is that this designer extraordinaire is also a muso. 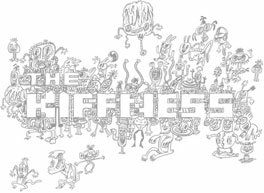 The Kiffness is UBER!!!! Yep, combing rock and old school retro video game vibes he and his band have created a truly unique style of music that appeals to the new school indie rock scene. If you would like to check out more about this crazy-weird-amazing band, jump across to their FB page and scope out their music videos. I believe that they will be playing a New Years gig up at Midmar Dam in KZN…if you are in the area (or even if you are not), def go and support these dudes! Oh and at the moment Mike is also developing graphics for an iPhone/iPad game. Yup, he is already working for international companies…nicely done sir, we are so happy for you. We will let you know more about this talented guy as it happens…which will probably be soon-soon! Hey Mike! I saw your animation “Get Busy” and was blown away! Great, great animation! I googled you and now want to purchase your book of ‘stuffs’ 🙂 I was wondering if you would kindly sign my copy? If so, how would the purchase process be made? Please let me know. I’m a cartoonist from Brazil, with a Japanese mom. Drawing and playing bass rock my world! Are you on Facebook? Thanks for your attention! And for the wonderful artwrok! Cheers, [—]. LOVE your animation. I do ‘spacey’ art – if you feel like it check it out at [—] everyone who sees it tells me I HAVE to animate it next, which is my plan! So glad I found you on the laughingsquid site! What do you use to animate? Are you still in South Africa? I’m in LA…the images in your animation have been in my brain all day today, so cool! Hi Mike, My name is [—] and I’m currently developing an iPhone/iPod Touch/iPad game. I’ve been trying to think of a style that I want for the game for sometime now, and this morning I landed upon your music video for Goldfish. The style is brilliant and It’s exactly what I’m looking for for my game. Saw that new video you did for Goldfish. It is so much fun! Full of awesome. Cheered me up when i most needed it. Keep creating! i’m a freelance cartoonist, but honestly i want something more Scott… so i branched into animation, it would be wonderful to get a few lessons in animation from you, i just got Anime studio 7. We love your style. My wife sends The Fort Knox video link to all her Last FM friends. A perfect fit of music and animation. Mr Scott – I recently purchased Anime Studio 6 abd have been using the tutorials to get started but I have felt there’s not enough information to complete a full animation. After viewing your clip Golfish Soundtracks & Comebacks at SmithMicro I began to wonder if you make this clip’s project files available. It’s easier for me to see other peoples work to get up to speed for work. What makes your video great is its slick design and full story arc. It would me a great tutorial. Well, it didn’t hurt to ask – thanks!